1877/1878: Godwin suggested that Whistler should paint a surrounding dado, and eventually Whistler decorated the panels at the back of the fireplace, overmantel and side-panels for Watt & Co.
Illustrations of the White House interior published in the British Architect show Whistler painting on the wall above a fireplace, but there is no mention of any surrounding structure. 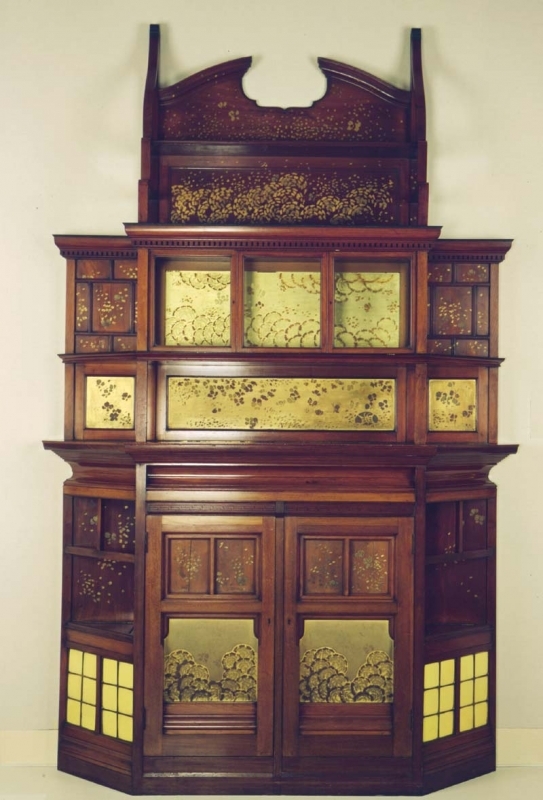 ca 1890: According to the Pennells, when the fireplace was acquired by Pickford Robert Waller (1849-1930), some twelve years after the exhibition, the stove and tiles were removed and the side panels converted into doors in their place, to create a cabinet. 10 However, this is not certain, since it had been described as a cabinet some eight years earlier. 1: YMSM 1980 [more] (cat. no. 195). 2: Victoria & Albert Museum, Godwin Notebook E.229 -1963, fol. 73; Soros, Susan, The Secular Furniture of E. W. Godwin, New Haven, 1999, p. 226 (cat. no. 369). 3: [1-2] October 1877, GUW #11240, Godwin papers, Victoria & Albert Museum, AAD4/3-1980. 4: Pennell 1908 [more], vol. 1, pp. 219-20; Merrill 1998 [more], p. 261. 5: Whistler to E. W. Godwin, [22 March 1878], GUW #01739; see also Godwin, E. W., 'Some Facts about "The White House,"Chelsea', British Architect and Northern Engineer, vol. 12, 26 September 1879, p. 119. 6: Whistler to E. W. Godwin, 25 March , GUW #01740. 8: Taylor 1978 [more], repr. p. 85. 9: Artist, vol. 3, 1882, p. 387; Aslin, Elizabeth, E. W. Godwin, Furniture and Interior Decoration, London, 1986, pp. 13-14 (cat. no. 9) plate 64. 10: Pennell 1911 A [more], p. 158.